Do you really need heating solutions for your construction project? The construction industry presents some of the most challenging and adverse conditions during winter, especially if you need to keep working during very harsh weather and low temperatures. However, there are a couple of solutions available to keep your employees comfortable and safe. These solutions are available for you at an affordable cost if you really need them. This type of heater is considered the most practical heating source for temporary applications. A direct fired heater works by heating air as it passes through an open flame. The heated air is then controlled by internal components. It is a very efficient way of heating areas and some of these heaters can run in temperatures as low as minus 30 degrees Fahrenheit. These units can be combined with ducts so the heater can be located several feet away from the working area. The cost of this type of heater is the least expensive of all temporary heating systems. Indirect fired heaters work by drawing cool air into two different chambers and discharging clean heated air to the desired location. These heating units are a bit more complicated and require more working parts thus the reason they are not as efficient as the direct ones. However, one of the key benefits is that air can be recirculated generating savings in the fuel usage. This is the preferred solution for hospitals and in areas where clean air is of the essence, like industrial facilities. Like direct heaters, indirect can also incorporate ducts to carry hot air where needed without carrying fuel hazardous by-products. Although not the best solution, electric heat is considered as a good choice when you need to heat small areas. It can also be used when dry heat is required but you need to bear in mind that electric heat is very costly and has some limitations. As an average, it can cost at least six times the previous two alternatives. However, electric heaters do not produce fumes and can also be ducted to transport heated air to remote locations. This type of heating solution works great when power is not available or when natural gas cannot be used due to safety restrictions. These heaters run on propane, making it ideal to carry it around and move it to different locations. It is ideal for temporary areas, indoor construction, and garages. These heaters need proper ventilation and can provide uniform heat to all working areas nearby. It can heat areas quickly and is an economical solution to heat construction areas. 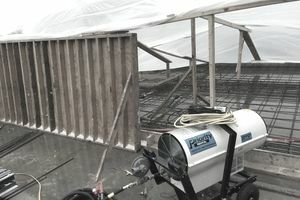 Hydronic heaters are being used by concrete contractors as they have found this to be one of the fastest means to help them during the concrete pour. The system works by heating an alcohol mixture pumped through heater hoses that are placed in the area needed to thaw or maintain as hot. These hoses are covered with a vapor barrier to prevent moisture from escaping into the air. Another way of using this heating solution is to connect the hoses to heat exchangers which are placed inside the working area, providing warm air. This heating solution provides heat only for a relatively limited area. What Does a Construction Superintendent Do? Looking for Construction Safety Courses? Check out Our Picks.